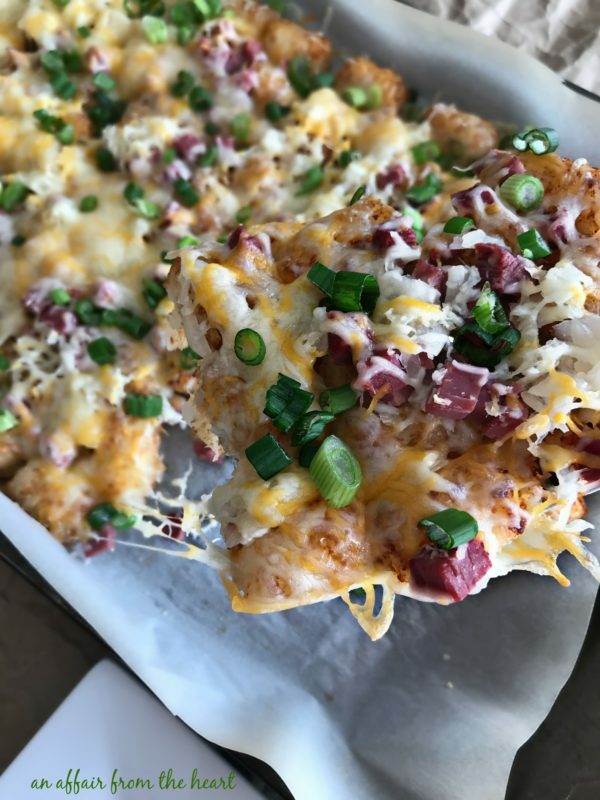 Tater Tot Nachos done Reuben Style — made with corned beef, sauerkraut, Swiss and cheddar jack cheese garnished with green onions and Thousand Island dressing. You, guys. I couldn’t WAIT to share these with you! Did you know that March is “Reuben Month?” I will be sharing all of my favorite Reuben Recipes this month, right along with my buddies from my favorite sauerkraut company, Frank’s Kraut. I have done MANY twists on that classic sandwich for them over the last couple of years. Everything from Reuben Casserole to Reuben Pizza from Cream of Reuben Soup to Reuben Burgers even Reuben Stuffed Baked Potatoes! St. Patrick’s Day lands on a Friday this year. As if there wasn’t a reason to celebrate anyway, this year it’s on a weekend. You’re going to want some party food! This appetizer has it all! Best part? It’ll feed a crowd no problem! 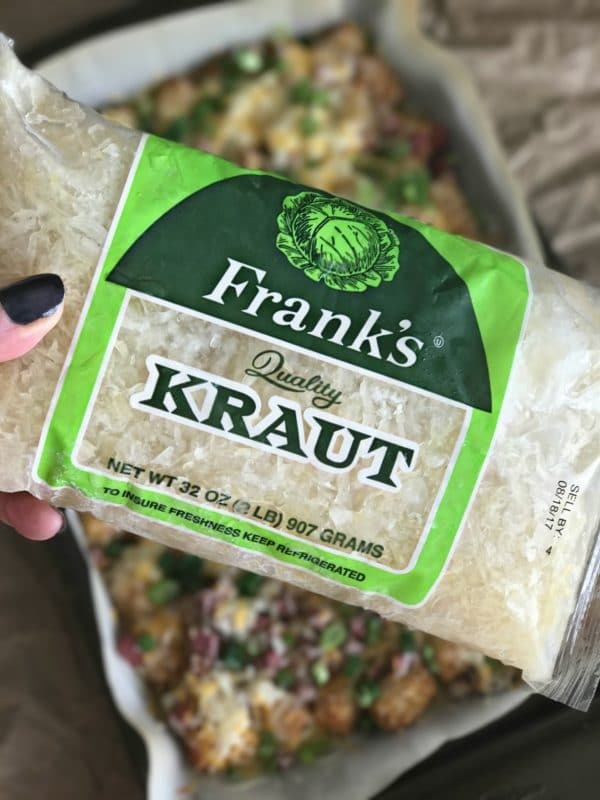 The main ingredient — Frank’s Kraut! I love these 2 pound poly bags! I have enough, so I never run out, and keep them in the freezer. I thaw them out when I am ready for it, and any extra goes into a mason jar and into the fridge for the next sauerkraut recipe! 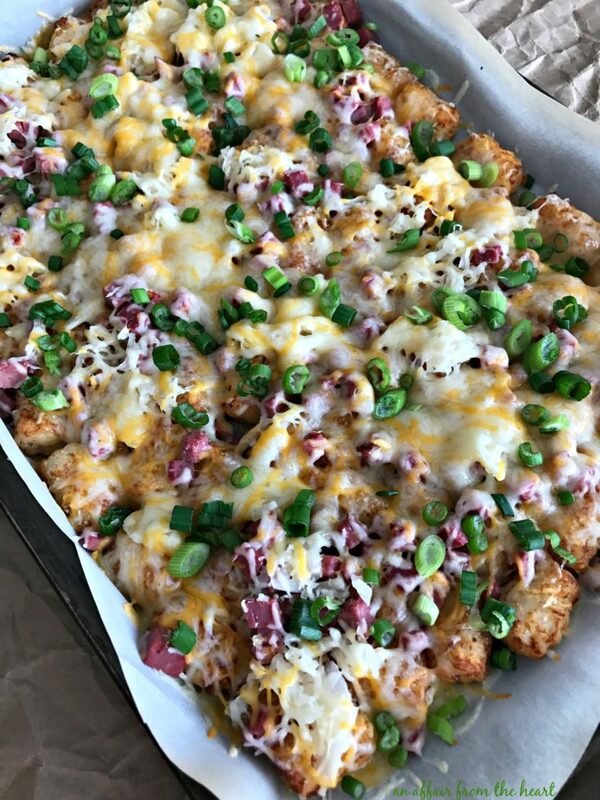 I have seen recipes for Tatchos (Tater Tot Nachos) and I have seen recipes for Sheet Pan Nachos — I decided to take both of those ideas, and throw in the components of the great Reuben Sandwich and create this amazing appetizer, that you could easily just make a meal of! 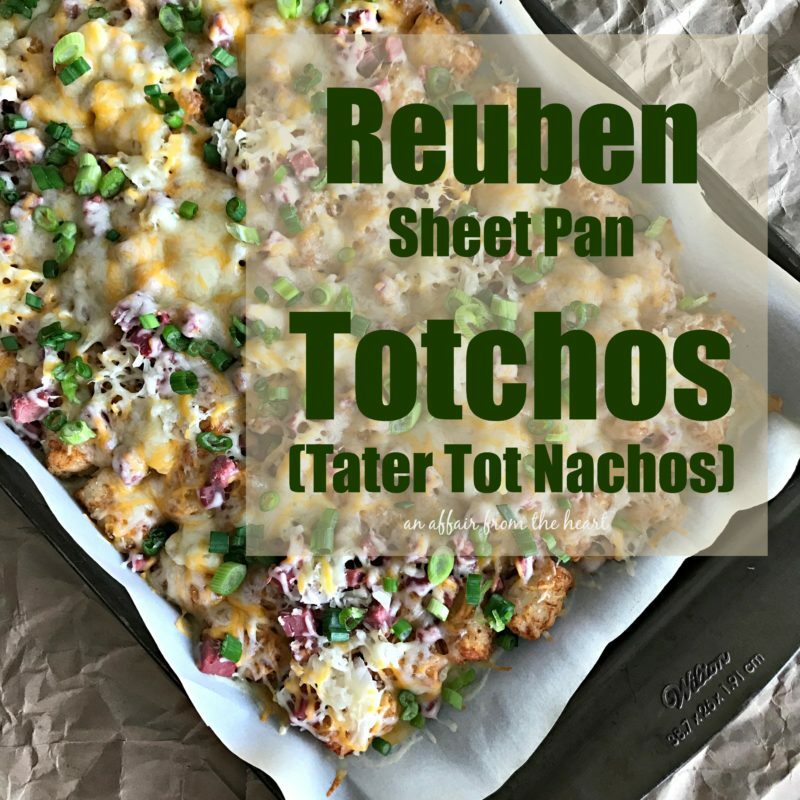 Reuben Sheet Pan Tatchos were born! Know what I love? You get yummy goodness in EVERY. SINGLE. BITE. I hate when you order nachos at a restaurant, and they are all layered and after you eat past the top, you are down to just plain ‘ol chips. 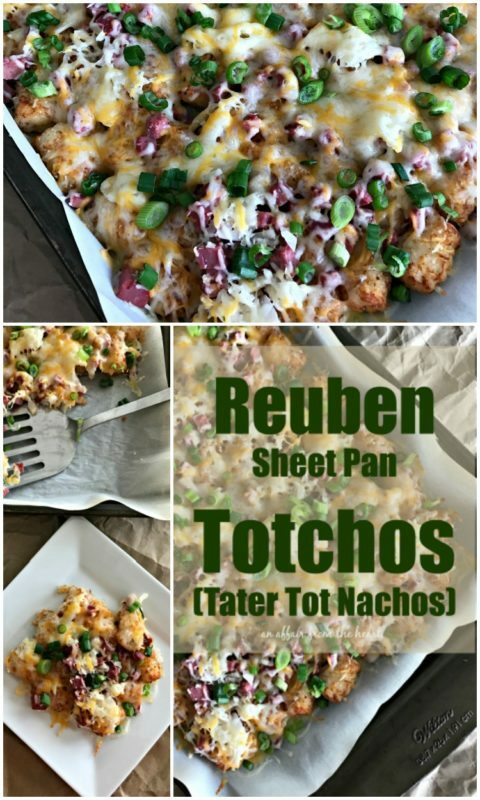 Not with these sheet pan Totchos. One pan, one spread out layer of yumminess. Just for you. 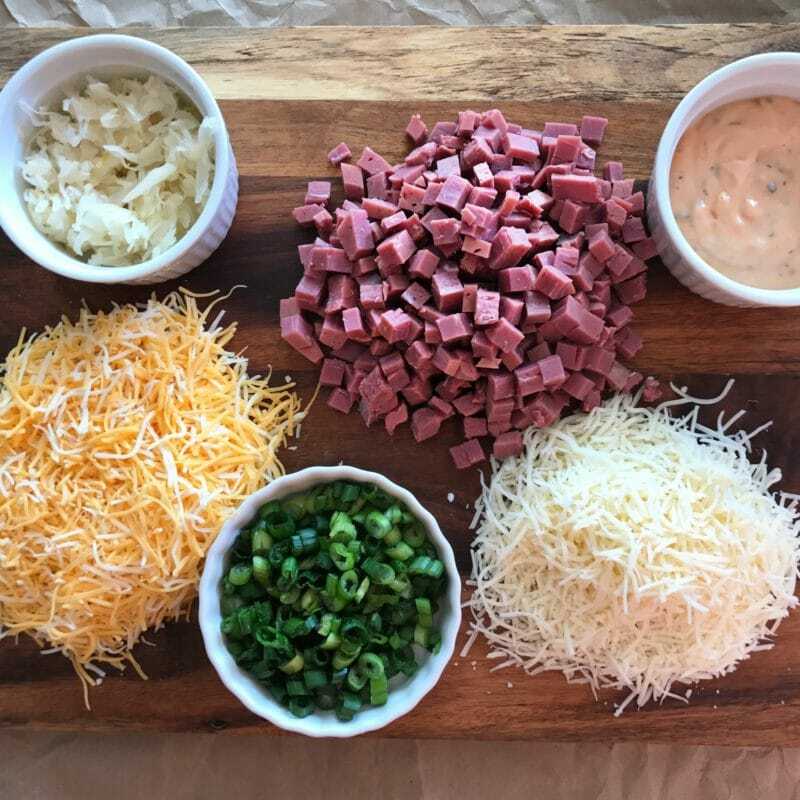 Look at all of that goodness waiting to be made into the best appetizer EVER! 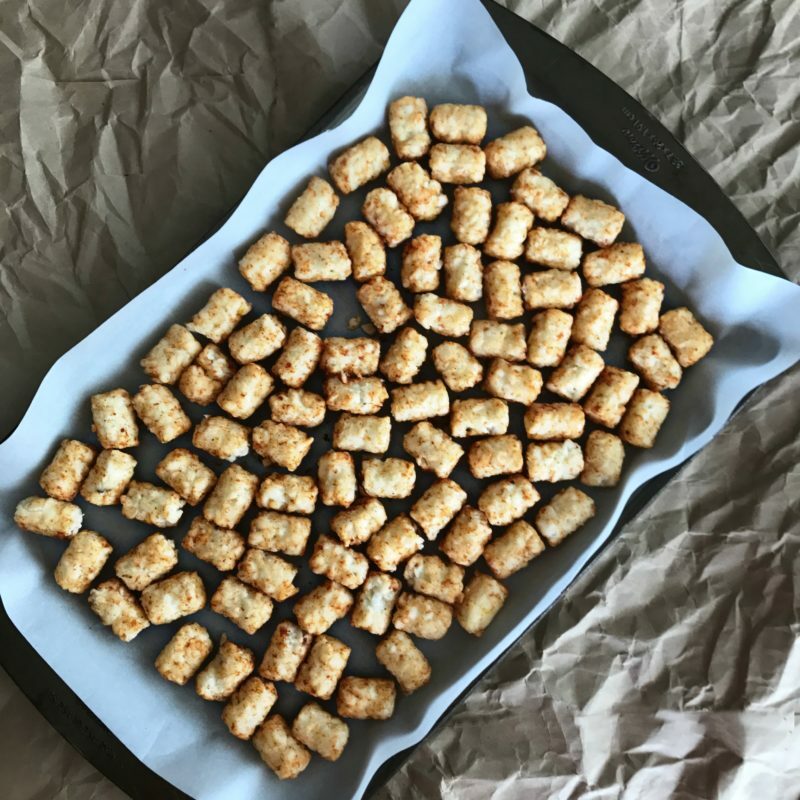 Line a cookie sheet with parchment paper and spread frozen tater tots out in a single layer. Bake. Top with cubed corned beef. Top with both Swiss and Cheddar Jack Cheese. Pop the sheet pan under the broiler til the cheese melts. Top with sliced green onions, and serve with Thousand Island dressing. What are you waiting for? 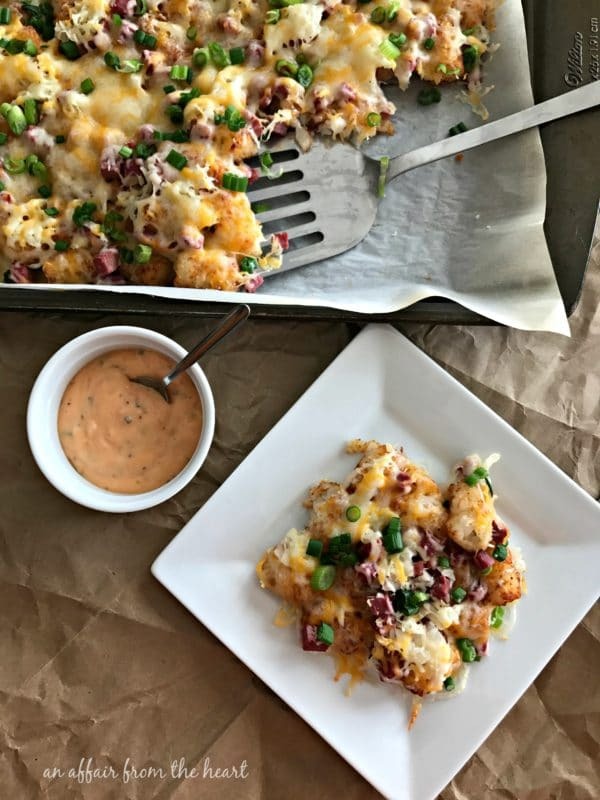 Use that leftover corned beef or just stop off at the deli and grab some to make these up today! Preheat oven to 425 degrees.Line a cookie sheet with parchment paper. 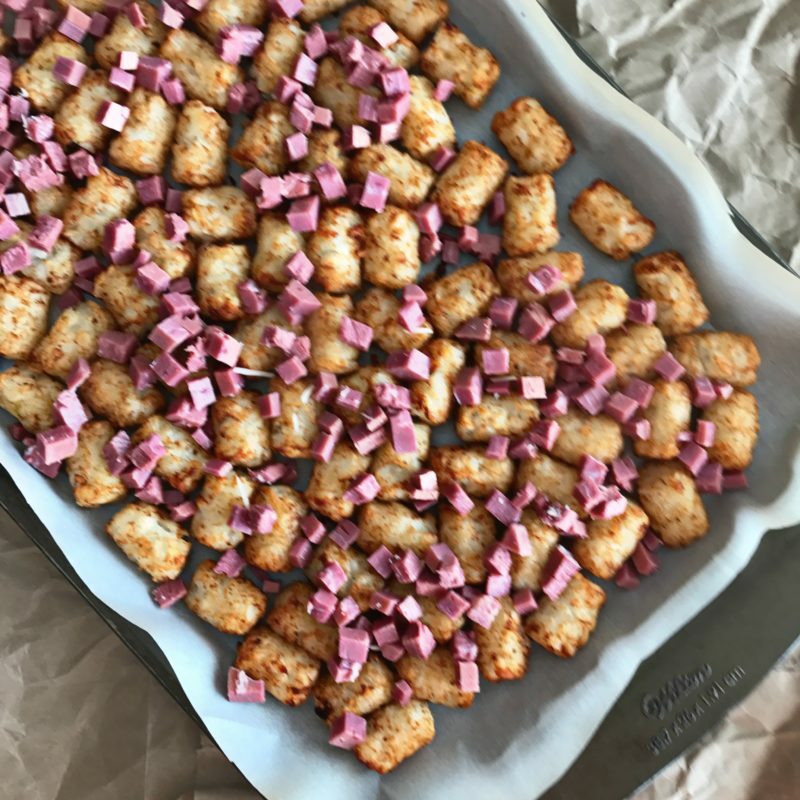 Spread frozen tots in a single layer over the parchment paper. Bake according to the package instructions. Remove when tots are baked and crispy. Top with cubed corned beef and sauerkraut. 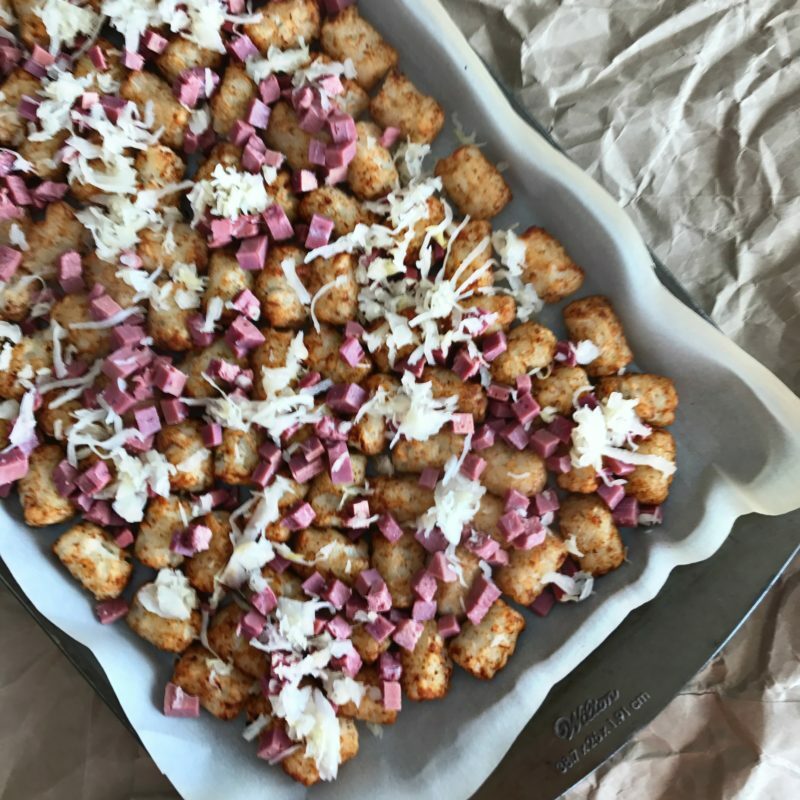 Toss both kinds of cheese together and sprinkle over the top of the tots. Turn oven to High Broil.Place sheet pan back in the oven, and watch closely, removing them as soon as the cheese melts. Sprinkle green onions over the top and serve hot with Thousand Island Dressing on the side. Want to put any Reuben recipe over the top? 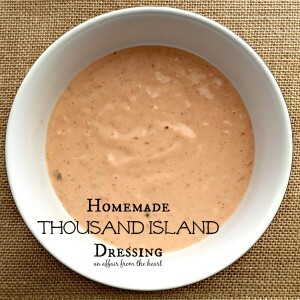 Use my Homemade Thousand Island Dressing! Follow along with Frank’s Kraut on their social medias to get delicious recipes year ’round, and Reuben recipes the whole month of March! O MY!!! Why stop at appetizers? I’ll make it for a main meal as I love all those ingredients. Carol – AGREED! We had it for lunch!! I love everything Reuben! Love this idea! I love this combo…looks fabulous! Oh my!!!! This is brilliant and amazing looking!!! I love everything about this! For sure this is going to be a HUGE hit with my family!! This is genius, Michaela and just in time for St Patrick’s Day! This is so much fun! I think this will be a great way to celebrate St. Paddy’s Day! This dish sounds amazing. I don’t think I would be able to stop noshing on it! Loving everything about this dish – what a feast this will be! I’ll be making this next week, thanks for a great recipe! You know me and sauerkraut…these would make me very happy! You know me and sauerkraut…I know I would love these! 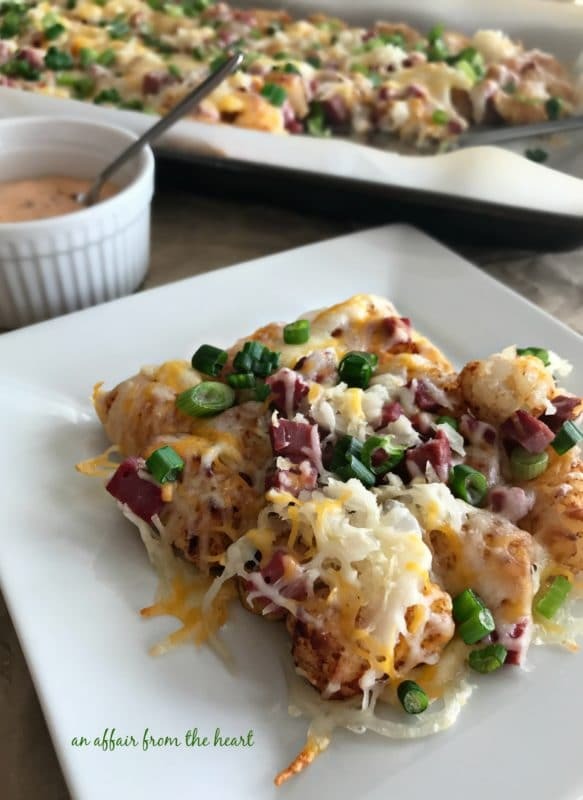 These Reuben Totchos are LIFE! The perfect appetizer. 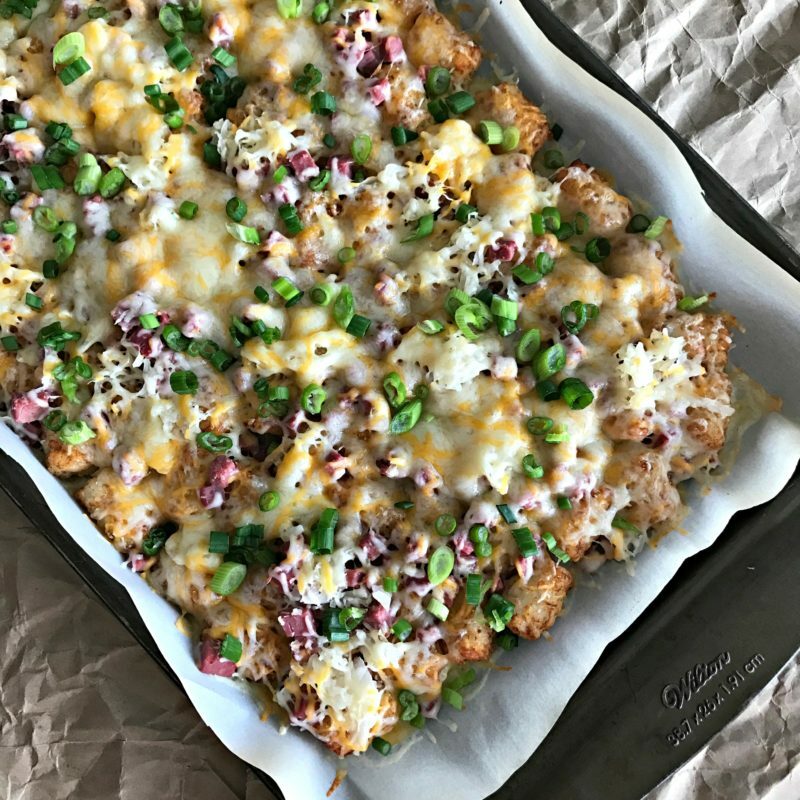 I totally believe that totchos are the wave of the future! 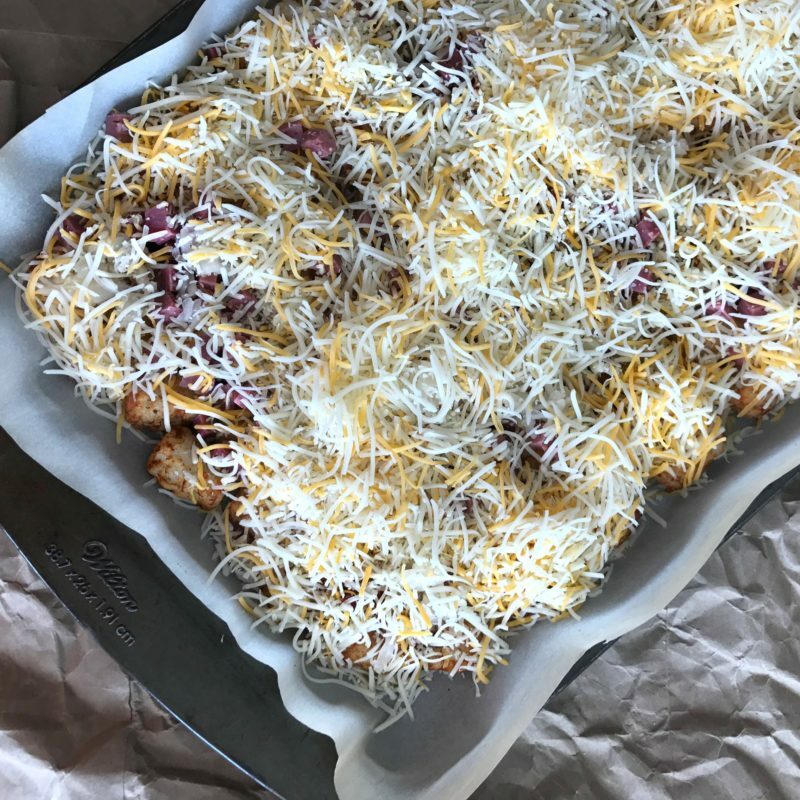 Why not have potatoes as a base for nachos instead of chips! No worries about soggy chips as the potatoes soak up all the goodness that is on the nachos and no topping is left behind! These are perfect for St. Patricks day! !